Indo-Chinese food....I love it ! 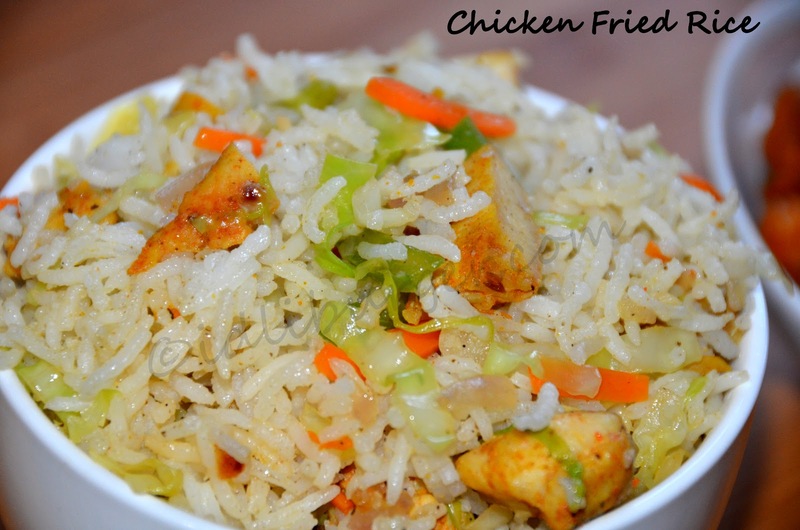 Almost every street in Hyderabad has one Chinese fast food place. They use these huge woks to create culinary magic. Thrown in little of this, a little of that and voila u have a plateful of yummy goodness. Here in LA there is no place that serves the Indo-Chinese food (atleast I donot know of any), so I decided to make some at home. The twist I have in the recipe is shan achar ghost masala :) Yup you saw it right. Had some chicken breast in the fridge and I just mixed about 2 tbsps of Shan Achar Ghost masala to it and it was YUMMY! Cook the marinated chicken with 1 tbsp water . When done keep aside. Cook the basmati rice with 1/2 tsp oil and enough salt for rice. Let cool. Heat oil, add sliced garlic and fry for about a min. Add the sliced bell pepper and fry for 2 - 3 mins. Now add in the carrots and fry for another 3 mins, stirring constantly. Add in the cabbage and cook for another 2 mins. Now add the cooked chicken pieces, ajinamoto if using, a pinch of salt, soya sauce, red chilly paste. Fry for 2 mins. 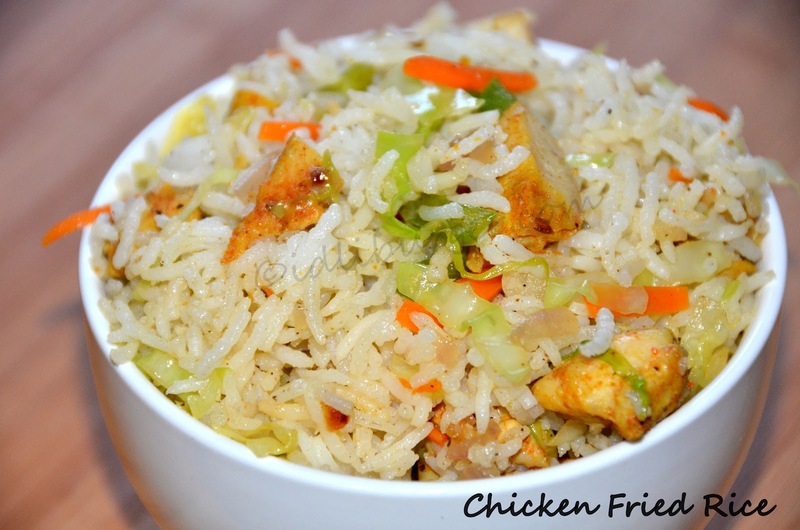 Add the cooked and cooled rice, white pepper, black pepper and mix well and switch off the stove. Serve hot with Gobhi Manchurian, Chilli Gobhi . Note : For Indo-Chinese cooking the wok should always be very hot so take care that the vegetables would not burn. 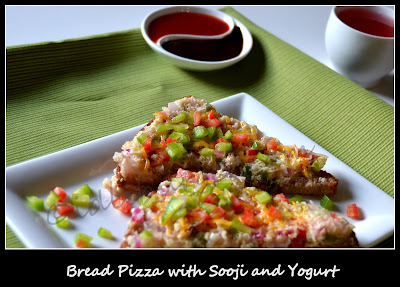 I've had and made bread pizza before but never with yogurt and sooji. I had this at a friend's place last week when we met for tea. Thanks P for the recipe. 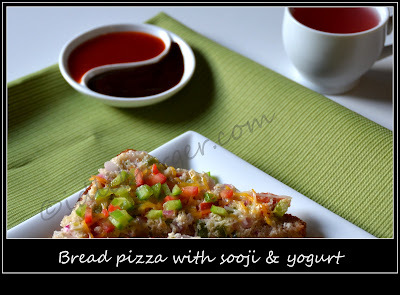 My son loved it and so I made it the next day at home and washed it down with some Jamun juice. I wish I had better pics. Toast the bread pieces and keep aside. Mix capsicum,carrot,onion,tomato, pepper,sooji and yogurt and keep aside for 1/2 an hour or till the sooji gets soft. Add salt to the mixture just before u start making the pizza. Spread the mixture onto one toasted bread slice and place on a heated pan with a little oil, mixture side down and cook for about 3-4 mins and carefully turn to the otherside. Add cheese and let stay for 2 mins , take off the pan into a plate, cut diagonally and repeat with the remaining slice. Note: These turn soggy pretty quickly so serve immediately. I'm sure most of u like me adore Indo-Chinese food. I can't tell u guys enough how fascinated I'm with these dishes. When in India a group of friends would go to this restaurant S.R Nagar which served the best Indo-Chinese food......I loved going there. Here in the US, I could not find any decent Indian place near my place which served this kinda food. The one I found did not serve the chilli gobhi. 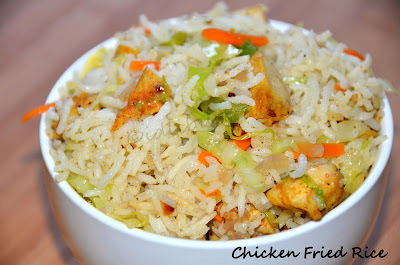 After much brainstorming with my friend N we came up with recipe :) and it is a huge hit. Cut the cauliflower into florets and blanch in boiled water for 3-4 mins. In a bowl mix all purpose flour, corn starch,cumin pwd, corriander pwd, salt, redchilly pwd, onion pwd,garlic pwd, soya sauce,oil and just enough water to make a batter (not too thin). Heat enough oil for deep frying. 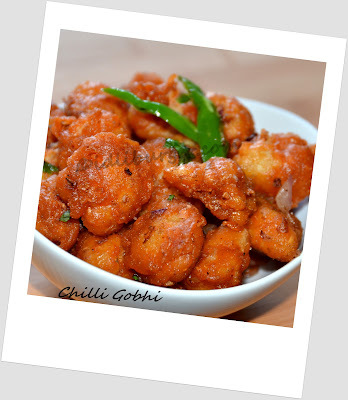 Dip the blanched cauliflower in the batter and fry for about 2 mins and drain onto a paper towel. Now increase the heat and fry the already fried cauliflower florets till crisp. Heat a wok, add about 1tsp of oil. When hot add minced garlic and fry (taking care not to burn) for about a min. Then add the minced onion and fry for another minute. Now add the sliced green chillies and fry for another 2 mins. Add the fried florets and sprinkle chaat masala and 1 tsp cilantro on it . Mix well. 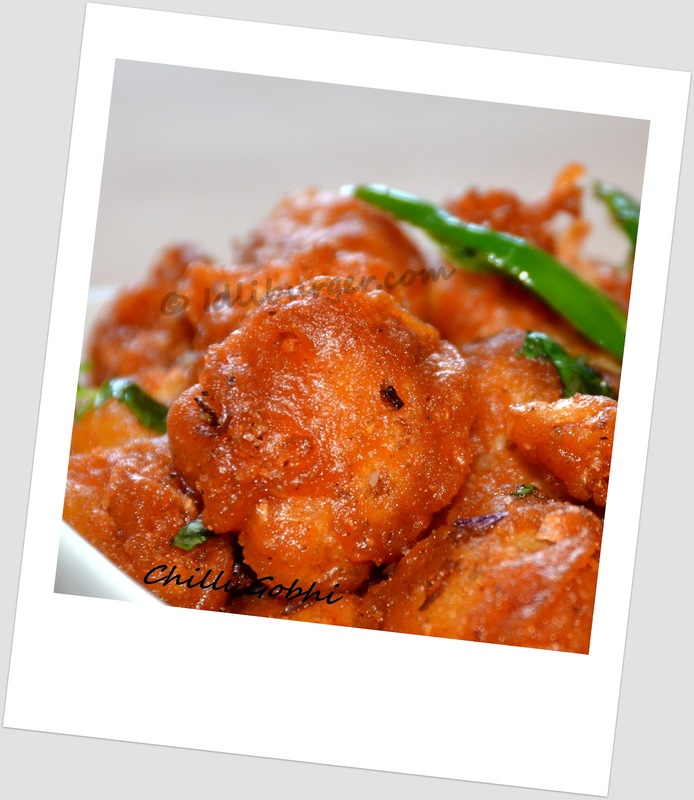 Categories: Cauliflower, Indian chinese, Indo-Chinese, Snacks, Vegetables, Vegetarian.